To address these provisions, the WQIP builds upon the findings and recommendations identified in the 2014 Report of Waste Discharge (ROWD) submitted by the Permittees to the San Diego Regional Water Quality Control Board (RWQCB). 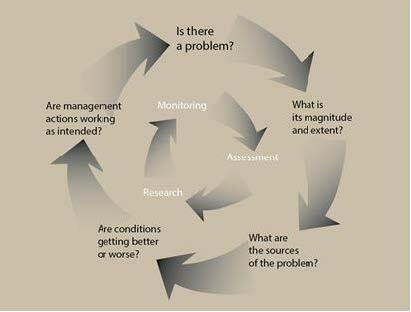 The figure below depicts the adaptive management process defined in the ROWD, describing five assessment questions and how priorities should shift among elements as information improves. Theme 1: Focus on priority areas and constituents rather than trying to monitor all constituents, potential issues, and locations. Theme 2: Increase the integration of data from a wider range of sources. Theme 3: Continue evolving from a discharge-specific approach to a risk prioritization approach. Goals, strategies, and schedules to address the identified HPWQCs and PWQCs were incorporated into the WQIP, along with the Monitoring and Assessment Program, that will be implemented to assess progress in meeting proposed WQIP goals. At this time, the submitted WQIP is being reviewed by RWQCB staff. The proposed South OC WMA WQIP can be viewed at https://ocgov.box.com/s/9h79wxg80gfcphi817plbz0yee08egve.